Dockweiler Beach is L.A.’s playground. People from all over the County come for a day of fun, relief from the heat, and bonding around evening bonfires. 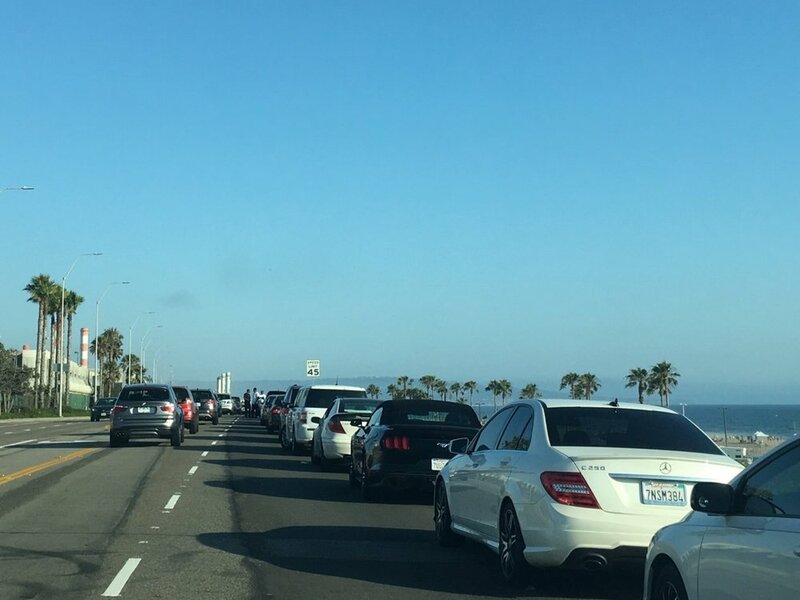 The 105 and Imperial Highway bring these families and friends directly to Vista del Mar, the street that Councilman Bonin and the DOT have recklessly turned into a danger zone. The road is very busy on the weekends. The new configuration mixes pedestrians — including small children — with cars speeding along the parking access lane; encourages illegal u-turns and jaywalking; and puts beachgoers in harm’s way with parking that does not offer a sidewalk or safe and handicapped-accessible pathways down the adjacent, perilous cliff. People are confused about where the parking ends, and wind up parking in traffic lanes, unaware that they are in a no parking zone. This creates a hazardous and abrupt bottleneck for drivers traveling South. And because the street is so poorly lit, the danger ratchets up exponentially after the sun goes down. What’s more, litter has become a massive problem, that’s difficult for the City to clean due to the placement of the parking berms. It’s unsanitary and unsightly, and bad for the coastal environment. Ironically, the lawsuit Bonin used to justify these changes alleged that the city created an Attractive Nuisance by having parking, no crosswalks and poor lighting. Those very same conditions not only still exist, they've been intensified by the re-striping. How can Bonin claim he’s made the street safer when so clearly it threatens the lives of Angelenos far more than ever before? Dockweiler has several large lots where people can safely park. They meet the standard of access required by the California Coastal Commission. There is no justifiable reason or defensible excuse for putting so many people at risk in so many ways. OpenStreetsLA is an inclusive and diverse group of concerned citizens who are donating their time and expertise toward safer, more efficient streets for all Angelenos. We are fighting for our neighborhoods and any others faced with such poorly planned and executed design. We believe Bonin’s Road Diet cannot end soon enough. Lives are at stake.